Walhall Retreat - Relax, Revive, Explore! 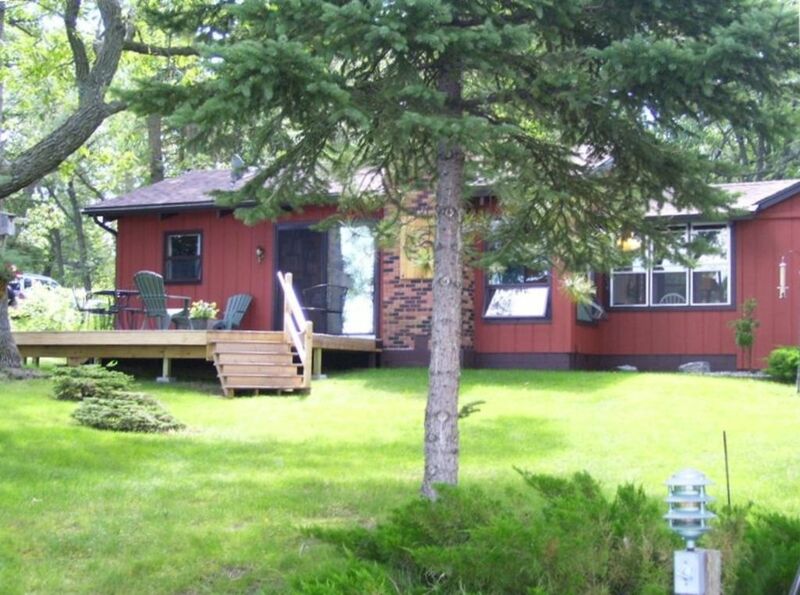 Nestled on a 1-acre wooded lot in west-central Minnesota's Otter Tail County, Walhall is a furnished 2-bedroom, 1-bath, pet friendly, 800 sq foot idyllic cabin located just off the crystal-clear waters of beautiful Lake Clitherall. Relax...watch and hear the loons, experience the sunsets, sit by the fire, gaze at the stars. Revive...go fishing, swimming, biking, golfing, hiking, or just sit around the campfire. Explore...Minnesota’s heart of the lakes region: Take a nature walk at Glendalough State Park; Visit shops of local crafters in nearby towns; Enjoy an afternoon of music on the patio at a local Winery. Walhall is just 19 miles north of Interstate 94, 4 miles south of the town of Battle Lake, MN. Kurt and Scott Maethner are brothers who grew up in Saint Cloud, Minnesota. Kurt is a businessman who has been living in the Battle Lake, Minnesota area since he graduated from Saint Cloud State University in 1988. Kurt, his wife Tanya and their daughter Addison enjoy living on Lake Clitherall. Scott retired from the United States Air Force after 25 years of service. He graduated from Concordia College (Moorhead, Minnesota) in 1990. Scott, his wife Terri and their three children Emily, Allison and Thomas currently live in Albuquerque, New Mexico. Walhall has been in the Maethner family for over 37 years. The cabin was originally built in 1970 by a friend of the family. In 1975, Art and Judie Maethner (Kurt and Scott’s parents) purchased the cabin as a summer retreat. Art and Judie were both educators so the entire family was able to enjoy lengthy summer breaks while school was not in session. The Maethner family built many wonderful memories at this cabin throughout the years to include fishing, swimming, nature watching and relaxing. After Art and Judie retired and Kurt and Scott left home to start their own lives, the cabin saw increasingly less use. After Art passed away in 2006, Kurt and Scott purchased the cabin from Judie. They converted it to a vacation rental to allow others to experience this wonderful place. Clitherall Lake is one of the cleanest and clearest lakes in Minnesota. If you are out on the lake fishing, you can see the bottom of the lake at a depth of 16 feet. You can literally see the fish come up to your hook to take a nibble. The lake is 2500 acres, has 14.1 miles of shoreline and a maximum depth of 70 feet. The area in which Walhall is located has been in tune with nature for many decades. Township, city, county and state government entities respect, appreciate and nurture our natural environment, keeping it as a top priority in all of their planning and development activities. The permanent residents of the area are also very good stewards of the environment. During your stay, you too will enjoy nature's blessings to include the ability to interact with a wide variety of wildlife. You will make friends with chipmunks and squirrels, observe otters, beavers and mink at work, and run across turtles swimming and sunning themselves. If you are a bird enthusiast, you will be able to observe many species to include loons, ducks, geese, robins, blue birds, finches, woodpeckers and many more. Fish that reside in lake Clitherall include walleye, northern pike, bluegill sunfish, black crappie, largemouth bass, rock bass, yellow perch and tullibee. Towels included, toilet paper included. 40' dock with 8x10' platform that includes two swivel chairs, a table, stairs & ladder. Nearby cell tower gives you good coverage and will enable you to set up your own wi-fi hotspot. Check out 'Galloping Goose Rentals' in Battle Lake for all your water sports rental needs. Check out 'Galloping Goose Rentals' in Battle Lake for all your bike rental needs. Boat lift available for $50 per week. We can provide local boat rental options. Pet Friendly, Local boat rentals available, Boatlift available ($50 per week); Lake slide available ($70 per week); Fishing gear provided upon request; Outdoor patio with fire pit (firewood included); ceiling fan; Private 1 acre wooded lot; Cabin located 500 feet from main road; 100 feet of lake shore; 40' dock which includes 8'x10' platform with 2 swivel chairs, table & ladder; electric air toy pump; iron and ironing board. Walhall is truly a special place. Welcome flowers upon arrival with a few other treats, lots of information for the area provided, very clean, has everything from outdoor games to fishing nets and a minnow bucket. Fishing off the dock was great fun for the kids. The slide and dock provided endless hours of entertainment and the lake itself is gorgeous! This property faces the sunset and has loons and eagles to be seen every day. Battle Lake is only a couple miles away and has fun shopping and good restaurants -- The Boathouse and Grannie's Pantry are must stops! J2 has a dock to boat to for great breakfast, coffee and panini sandwiches. Kurt is very easy to deal with and will help out in any way. This was the perfect summer vacation for our family and we will definitely be back! Thank you Walhall and Kurt for ending our summer on a high note! And thank you for being dog friendly so we can bring our entire family!!!! Our stay was great! The cabin was very charming and very clean. The weather was great, fishing even better and beautiful sunsets every night. I highly recommend this cabin for anyone looking for a quiet relaxing stay in a cozy cabin. The kids had a blast fishing off the dock and using the slide. Very close to a small town with charming restaurants. Everything we needed for a great family vacation. We will definitely book again! We thoroughly enjoyed a 4-day labor day weekend stay at the Walhall retreat. Very peaceful and relaxing. We especially enjoyed the numerous settings to enjoy a meal, cup of coffee, etc (deck, dock, firepit, breezeway). Eagles and loons were observed every day. Loved the biking that is close by. We've stayed at many vrbo locations and this one probably was the best equipped with high quality accessories (grills, utensils, etc). Highly recommended! Walhall is really a special place. The owners have created a great, comfortable and unique little vacation spot. We so enjoyed our week here and loved all of the little touches of Minnesota and Nordic culture around the cabin. Lake Clitherall is a beautiful lake and there is plenty to do around the area. We golfed every day at a different golf course, boated, swam, fished, took long walks, visited the state park nearby, and loved sitting out by the fire every evening. The cabin is quite small, but perfect for our getaway just the two of us & has every amenity we could have ever needed. Thank you for a wonderful vacation. Inviting and convenient in every way. Peaceful and private. Our granddaughters caught fish off the dock every night and loved it! Swimming in the clear lake was grand. The kids had fun in the loft. We played games on the lawn and had evening campfires. Fine memories! Our fourth stay here. Continues to be a great place. Absolutely everything you would need. Beautiful lake, property, a cabin is perfect for our young family of six. Fishing is excellent for the kids with great swimming area right off of the dock. Just bring your clothes and lake toys. Battle Lake also has a terrific grocery store & bait shop with everything you need. Don't forget Granny's Pantry! Thanks again Walhall! 5 miles from Glendalough state (with walking and bike trails); 10 miles from Inspiration Peak (2nd highest point in Minnesota); 15 miles from Central Lakes Bike Trail; Local winery; Turtle races in Battle Lake; Granny's Pantry (candy & ice cream); Art of the Lakes Gallery, Prospect House Museum; Lakes Area Community Center; Fort Juelson; Henning Watermelon Day. $85 cleaning & laundry fee applies to all stays. Additional fees apply for optional boat lift rental ($50 per week), lake slide ($80 per week). No tax on cleaning fees. No tax on stays longer than 30 days. $200 extra for premium week reservations (Memorial Day, 4th of July, Labor Day).